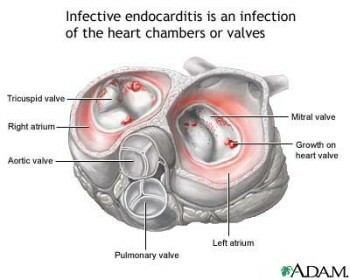 Endocarditis is an inflammation of the endocardium; it is usually limited to the memrane lining and the valves. The cause of endocarditis may be viral, fungal, or most commonly, bacterial. The most common organism is Streptococcus viridans. Vegetations (growths or lesion) may cause vulvular dysfunction, with mortality from endocarditis being as high as 25%. Risk factors include any high-risk individual as a patient with valvular disese or mitral valve prolapse; undergoing any type of invasive procedure, especially dental surgery; any chronically ill individual, especially one who is immunosuppressed; any individual with previously damaged or congenitally malformed valves; any individual with prosthetic valves; and illicit drug users. The hallmark of endocarditis is a fever and a new murmur. Signs and symptoms of heart failure may be present. Nursing Diagnosis: Decreased cardiac output secondary to valvular dysfunction from infective process. Monitor pulse pressure and central venous pressure hourly or more frequently if titrating pharmacologic agents. Obtain Bp hourly or more frequently if the patient’s condition is unstable. Monitor hourly urine output to evaluate for responses to pharmacologic interventions. Analyze ECG rhythm strip at least every 4 hours and note every rate. Obtain HR, RR, and BP every hour or more frequently if the patient is exhibiting signs and symptoms of heart failure. Assess for changes in neurological function hourly and as clinically indicated. Assess skin for warmth, color, and capillary refill time. Assess distal pulses bilaterally for strength, regularity, and symmetry. Review BUN and creatinine levels to evaluate renal function. Review endocardiography finding if available for valvular and ventricular function and presence of vegetation. Review WBC counts to evaluate course if infection. Provide supplemental oxygen at 2 to 4 L/min to maintain or improve oxygenation. Minimize oxygen demand to decrease anxiety. Maintain patient on bed rest if in acute hear failure. Administer multi-I.V. antibiotic regimen as ordered. Administer antipyretics as ordered and as needed. Prepare the patient for anticipated surgical intervention to repair or replace affected valves.